All Sponsorship levels are open. 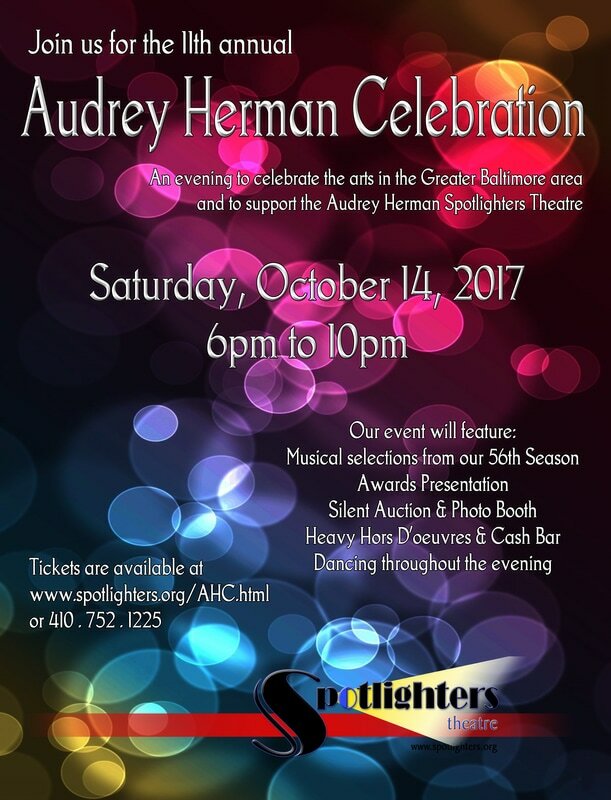 If you or your business is interested in being a Sponsor for the 2017 Audrey Herman Celebration, please click here for more information. Valerie Lash, Dean of Arts and Humanities, and Professor of Theatre at Howard Community College, and Founding Artistic Director of Rep Stage, has been involved in Baltimore area theatre for 50 years! She has an MA and BA in Theatre from The Catholic University of America, an AA in Theatre from Essex Community College and an MA in Literature from Morgan State University, and has studied acting with the late Walt Witcover at Master Works Laboratory Theatre in New York. Some favorite acting roles include: Mag in The Beauty Queen of Leenane and Martha in Who's Afraid of Virginia Woolf? both at Spotlighters; and Mrs. Clancy in The Italian Lesson; Franny in Technicolor Life; Josie Hogan in A Moon for the Misbegotten; Woman B in Three Tall Women; La Marquise de Merteull in Dangerous Liaisons; Oulsa in Six Degrees of Separation; Aunt Dan in Aunt Dan and Lemon; Amanda in The Glass Menagerie; Bessie in Marvin's Room; and Elmir in Tartuffe, all at Rep Stage. In addition to producing, artistic direction and acting, Valerie has performed a long list of theatre creative, administrative and support functions, everything from directing, designing, choreographing, stage and house managing to general cleanup! She has received a Howard County Arts Council's "Howie Award" as Artist of the Year and has lead the college into being honored by the Council with its rarely given “Legacy in the Arts” lifetime achievement award. She has also been inducted in the Howard County Women’s Hall of Fame. Michael Tan is the Director of the Center for Alternative and Supported Education at the Community College of Baltimore County, providing courses to adults with developmental disabilities. He has a BS in Psychology from Duke University, his JD from Washington and Lee School of Law, an MS in Pastoral Counseling from Loyola University, and an MS in Theological Studies from Wesley Theological Seminary. He keeps his bar status active in order to provide pro bono services to at least six local arts groups, including Spotlighters, by helping them to incorporate and get their 501(c)(3) status. Michael has been a member of the Board of Directors of Spotlighters for the last 11 years, serving as secretary for most of that time. He has volunteered his time at Spotlighters in fundraising, promotion at public events, clean up, proof-reading materials, as well as on and off-stage. As a local music director who has worked on more than 45 shows in 7 theatres in the Greater Baltimore area. His favorites include: Das Barbecü; Evita; Zombie Prom; Altar Boyz; The Rocky Horror Show; Into the Woods; The Full Monty; Company; Avenue Q; A Little Night Music; The Great American Trailer Park Musical;Cabaret; Sweeney Todd; Bare: a Pop Opera; Six Dead Queens and An Inflatable Henry (American Premiere); Falsettos; Sunday In The Park With George; and The Spitfire Grill. 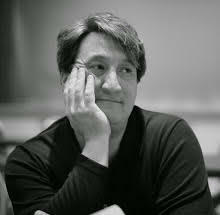 He directed the BPF musical Unraveled on the Gravel (World Premiere, 2nd Best Production). His favorite onstage roles include Michael Novak (God of Carnage), Murray (The Odd Couple), Gregor/Papa and the Arbiter (Chess), The Senator (Hello Again), and Officer Murphy/Frank Maurrant u/s-one performance in role (Street Scene). He is the music director at St. John’s UCC, and does vocal coaching as well. He was named Employee of the Year at Integrated Health Services, Inc. in 1997, and the Arc Baltimore named him Professional of the Year in 2016.